at the Killer Nashville Conference where we both served on a debut novel panel. as much as it was to write a book about the abuse of women. the readers how it is that you turned to writing? Is it something that you’ve always done? about writing so I thought (foolish girl that I was) I knew it all. her lungs. Doesn’t happen when I edit my own work, more’s the pity. trying to break into traditional publishing today? telling you why your book can’t be published, change it. How can my readers contact you or buy your book? those as soon as I have them. us a hint of what we can expect when we read your book. Neva are such a good couple. Or perhaps that’s why they can’t move forward. mysteries and free each other to embrace their future. 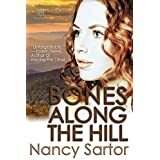 Be the first to comment on "Bones Along the Hill"
Wonderful interview. Thanks for sharing! Interesting advice for getting published. I'll keep that in mind.